The primary purpose of this cruise is to survey reef fish. Our main task is to collect data pertaining to presence and number of fish species, species length frequency, and sample materials for fish age and growth. However, other types of measurements are being made as well. 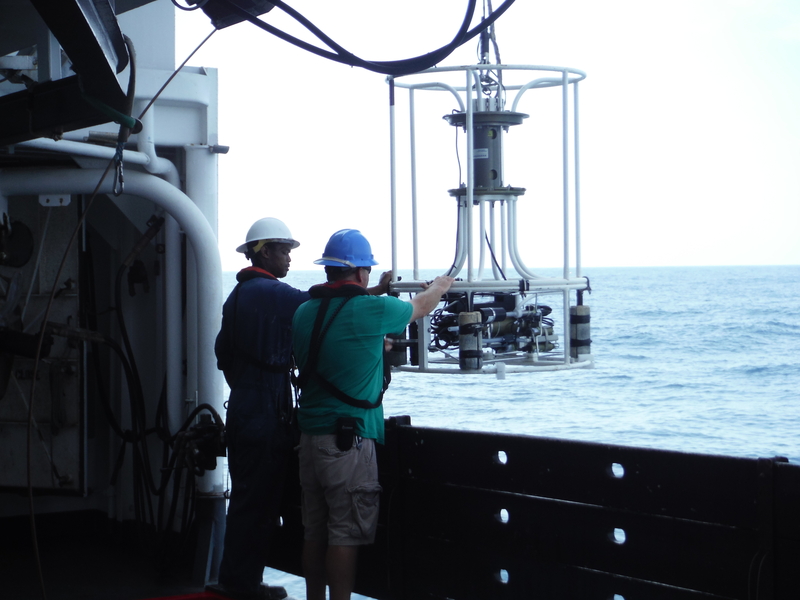 For example, the CTD is an instrument that measures different properties of ocean water with depth. It is deployed every time the fish traps are dropped. 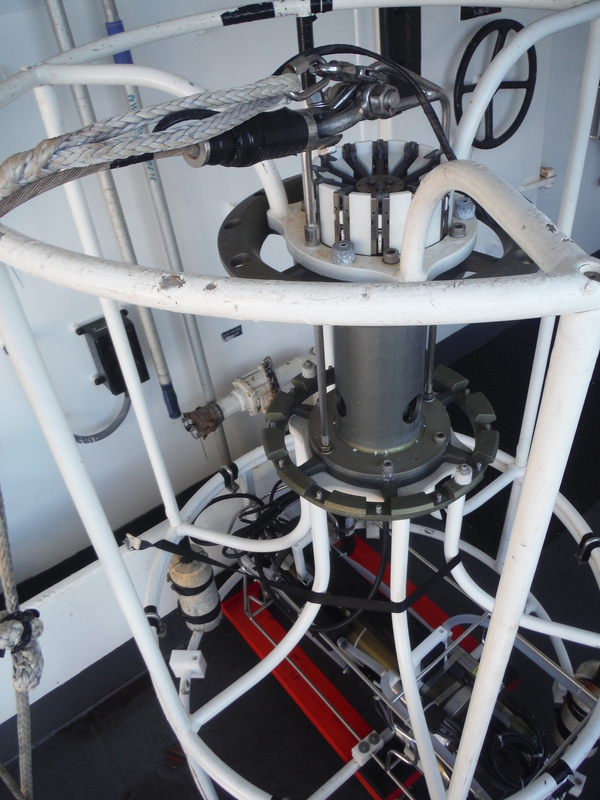 The CTD sits on the starboard side of the deck of NOAA Ship Pisces. The acronym “CTD” stand for conductivity, temperature, and depth. The instruments that measure these properties are affixed to a metal cylinder called a rosette. A range of sensors can be attached depending on what needs to be measured. Additionally, containers can be attached to the frame in order to collect sea water samples at different depths. When the ship reaches the designated coordinates, the survey technician calls to the deckhands and instructs them to use the winch to lower the CTD to a designated depth, and then haul it back up. Deckhands assist with lowering the CTD. The y-axis represents depth in meters. The CTD actually measures water pressure, which is then converted to depth. Pressure and depth are directly related: as depth increases, pressure increases. What do these measurements mean? As depth increases, temperature decreases. Sunlight warms the sea surface, and wind and ocean currents distribute this heat energy throughout the upper waters. 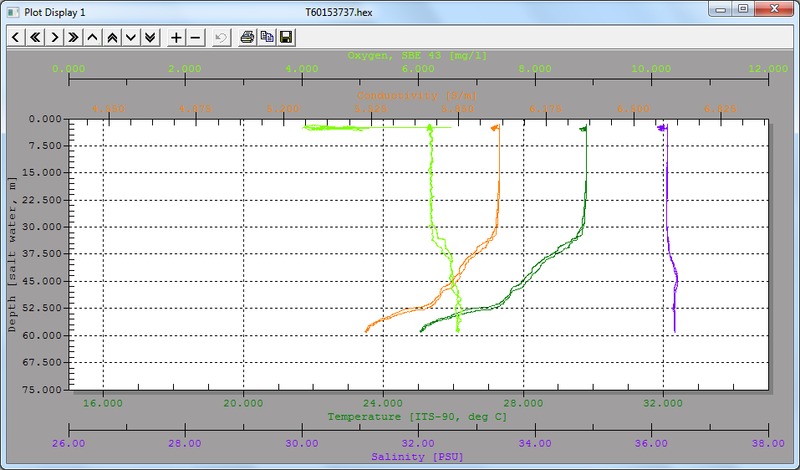 Beneath this mixed layer, temperature decreases steadily with depth. In deeper water (not at this location), this rate of change decreases and the temperature of deep ocean water is nearly a constant 3 °C. Salinity refers to the concentration of dissolved salts in the water. Average ocean salinity is 35 ppt (parts per thousand), though this varies by a few parts per thousand near the surface. Increased precipitation, runoff, or melting of sea ice can decrease salinity, and evaporation and ice formation can increase salinity. Conductivity (measured in Siemens per meter) is a measure of how much current can travel through the water, and this is affected by both salinity and temperature. Finally, fish and other marine organisms require dissolved oxygen to breathe. By measuring the amount of oxygen at different levels in the water column, we can determine how much sea life can be supported in a given area. Dissolved oxygen in the ocean comes from mixing at the surface, and is also produced by photosynthetic organisms. As temperature and salinity increase, dissolved oxygen levels decrease. Additionally, temperature and salinity data can be used to determine the water density, or the mass of water per unit volume. Different fish can tolerate certain ranges of all of these chemical and physical parameters. With respect to the fish survey, this information is important because we can monitor the conditions of the water near the ocean floor where the traps are located. For scientists who are interested in characterizing reef fish habitat, this data is a critical component of their research. There are other ways in which this data can be used. The depth profiles of each of the chemical and physical properties at a given site can be compared to other local sites in order to identify any spatial anomalies. This is of great interest for seafloor mapping and ocean exploration cruises. For example, a change in conductivity and temperature at a site in the middle of the ocean could indicate the presence of a hydrothermal vent. Or, a decrease in salinity in a region along a coastline could indicate freshwater runoff. Additionally, as measurements are made at similar locations over a period of time, temporal changes may be observed. This could reveal seasonal changes, or a long-term trend. Because we are observing an increase in average global temperatures and experiencing global climate change, it is critical to collect data that can be used to assess changing ocean conditions. “Will you be eating a lot of fish on the ship?” I heard this question a lot before I left for this cruise. I wondered myself. 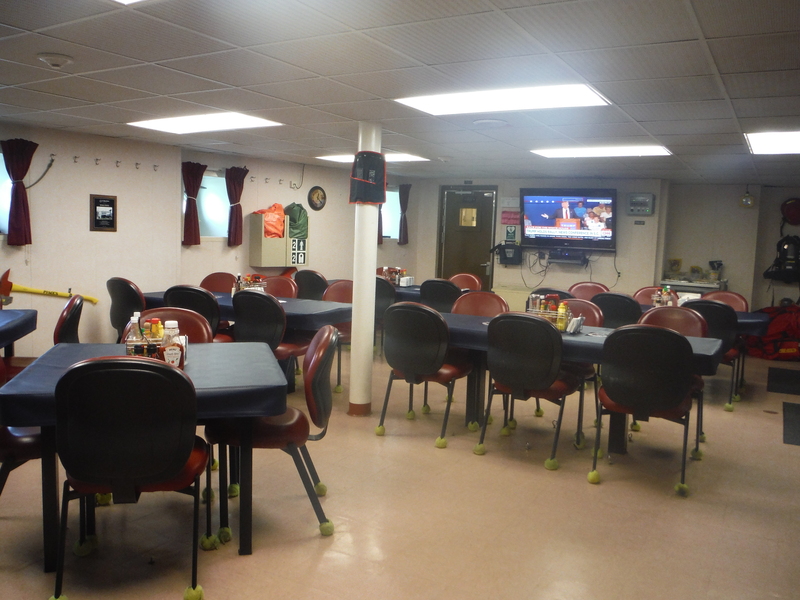 It seemed reasonable that fish would be prepared for meals because, well, we will be living at sea! On the other hand, I wondered if everyone on board would be sick to death of fish because we would be looking at them all day. As it turns out, fish is prepared for nearly every meal; however, there is often another meat option, as well as a variety of other non-meat dishes. Now we know! There are many fish that make a grunting sound. When we have tubs full of tomtates in the wet lab, it sounds like a bunch of miniature pigs making snorting noises! Still from video of tomtates near a trap. 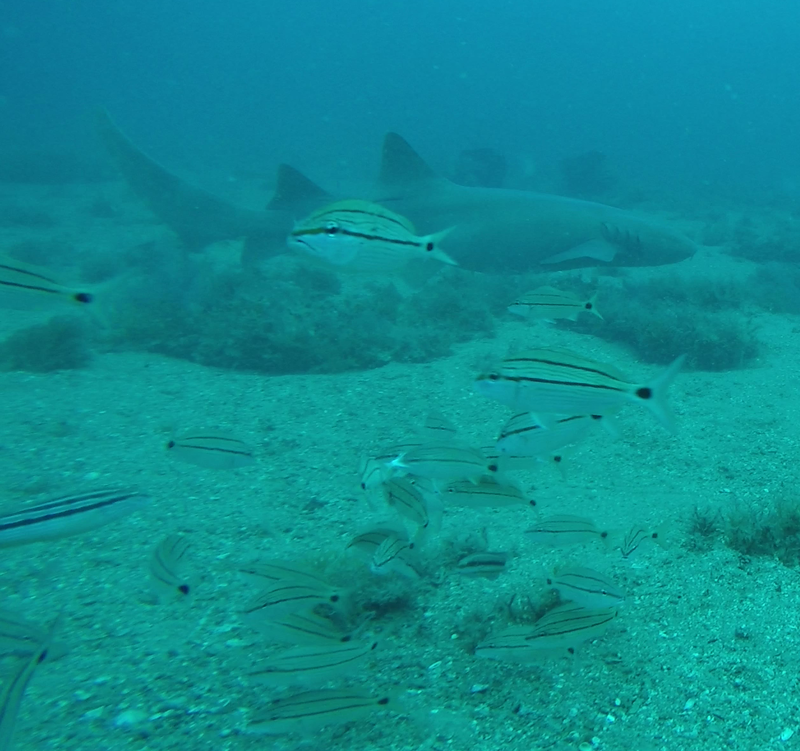 A nurse shark can be seen in the background. This entry was posted in 2015, Leah Johnson, NOAA Fisheries Service, NOAA Teacher at Sea and tagged conductivity, CTD, depth, leah johnson, NOAA Ship Pisces, NOAA Teacher at Sea, oxygen, reef fish, salinity, tempurature. Bookmark the permalink.